There are few people in the world who don’t like to start their days with a cup of coffee (or five). Some drink it because they need it, others just because they like it. Either way, coffee must be at hand first thing at the break of dawn. You can drink it in a gazillion coffee shops all around town, but there’s nothing that beats the home-brewed one. It simply tastes better when you make it with your own hands – or with the press’s own plunger. We all know that the food of the gods was called “ambrosia.” The beverage of the gods was called “nectar,” but it was actually coffee. Coffee made with a French press, to be more precise. French press brewed coffee is strong and sure to knock your socks off. That’s why Hermes was wearing sandals. If you don’t know how to brew it, don’t sweat it! You’ll learn how to do it with this step-by-step guide. First off, let’s see what a French press is. Let us proceed! French Press – What Is It and What Does It Do? 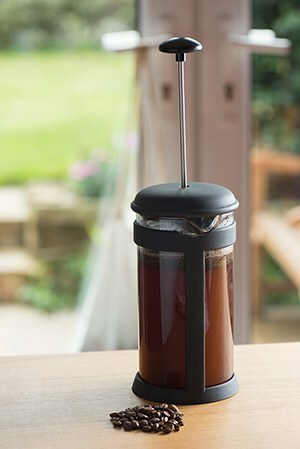 Because it’s no rocket science, let’s stick with a basic definition: a “French press” is a cylindrical beaker usually made of glass or stainless steel with a plunger (or piston) running through the middle of it. While most people think that the plunger compresses the grounds to release the flavor, it does not. It simply keeps them amassed at the bottom of the beaker so that the hot water works its miracles. Paradoxically, the “French” press is not French at all. It has been invented by the Italian Attilio Calimani. The first model was patented in 1929, and it hasn’t changed much since. The press goes for a multitude of other names all throughout the world. It’s probably known better as cafeteria. Now you know what it is and what it does. We’re probably ready to start brewing your first coffee with the notorious French press! You can either just rinse it or fill it with water and bring it to a boil. It will clean it, and it will also prepare it for brewing. The temperature will be steady, so you’ll get the best coffee. 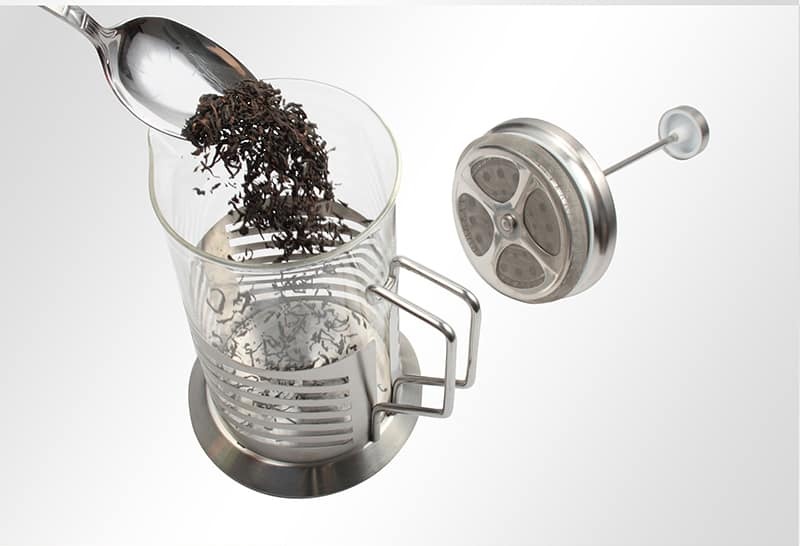 As the water is boiled – or as soon as you’ve finished rinsing the beaker – you can start grinding the coffee beans. It can be any type of coffee you wish. Usually, the grounds for the French press must be the size of breadcrumbs. If you’ve got a liter of water in the beaker, then you’ll want approximately 70 grams of grounds. This is really more of a matter of taste, but for the moment, use the standard amount. After you’ve brewed for a couple of times, you’ll know how many grams are perfect for your own taste. Empty the beaker of the hot water. Now it’s the moment when we’re getting to the actual brewing phase. Once you throw out the water from the beaker, add your coffee grounds - 70 grams. As for the water, there are two ways of adding it: either fill the beaker with hot water from the start, or add it steadily. It doesn’t really have that much of an impact on the taste, but many assume that adding water in two sessions allows the grounds to soak up better and release the flavor quicker. Let’s say that they’re right. In this case, you’ll want to add twice the amount of water for the amount of coffee grounds. So, if you have 70 grams of grounds, you’ll have to add 140 grams of hot water. This procedure is known as “bloom.” The “bloom” is fundamentally the degassing of the coffee. When the grounds are hit by the hot water, it’s almost like they effervesce and rise up. Once again, this isn’t something you are bound to do. You can add all the water at once or rely on bloom. It’s your choice and yours only. You can, of course, try both methods and see which gives the best results. If you’re using a glass French press, stir with a wooden spoon, so you don’t crack it. Let the coffee bloom for 35-40 seconds then stir it until it sunk completely on the bottom of the beaker. It’s not going to float anymore. Also, the smell it diffuses is amazing, and that’s just one more advantage of brewing your coffee. PRO Tip: When the grounds are not wet enough, they tend to float upwards, on the surface of the water. The result of that happening is simply bad coffee. Pour hot water into the beaker until it’s filled up. Wait for 4 minutes. Precisely 4 minutes! Use a timer. This is the standard brewing time for the French press, although there are some that brew the coffee for as much as 8 minutes. We’re not daredevils, so we’ll take the high road. Pro Tip: The greatest advantage of using a French press is that it allows you to experiment. You needn’t do the things in a classic fashion. Toy around with the amounts and the brewing time in order to get the best taste. 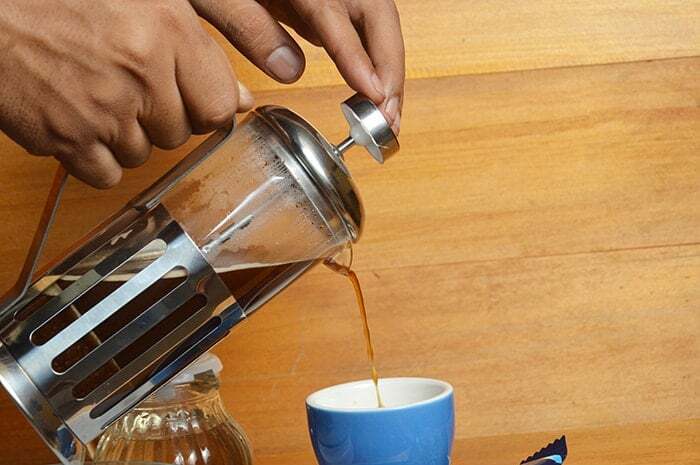 There is one common mistake that keeps on reiterating when it comes to this step in brewing with the French press: pressing the piston/plunger too quickly. Brewing is a very gentle process. 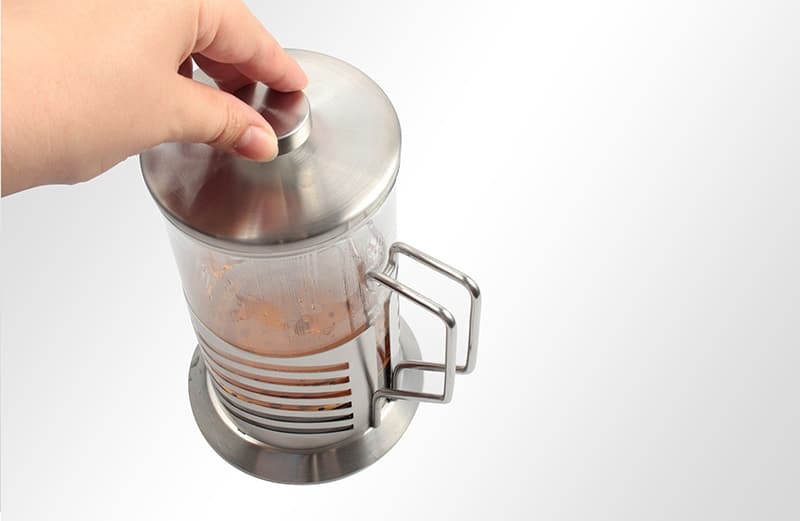 Pressing the piston too quickly upsets the coffee grounds and releases a bitterness that spoils the coffee. Do it steadily. Sometimes, it gets harder to press it, as the grounds get thicker. Back the piston up a little, then plunge again. When you get to the bottom, your coffee’s ready. If you don’t pour the coffee as fast as you’ve reached the bottom with the plunger, it will continue to brew uselessly. You can, however, let the coffee sit for a minute or so, in order for the little bits of grounds to settle completely on the bottom of the beaker. Pour the coffee in cups, then clean the press by rinsing it with hot water. That’s it! You’ve made your first coffee with the French press. Easier than you thought, right? Apart from its superior taste, the coffee brewed with a French press comes with a set of advantages. First of all, it’s not made with filters. 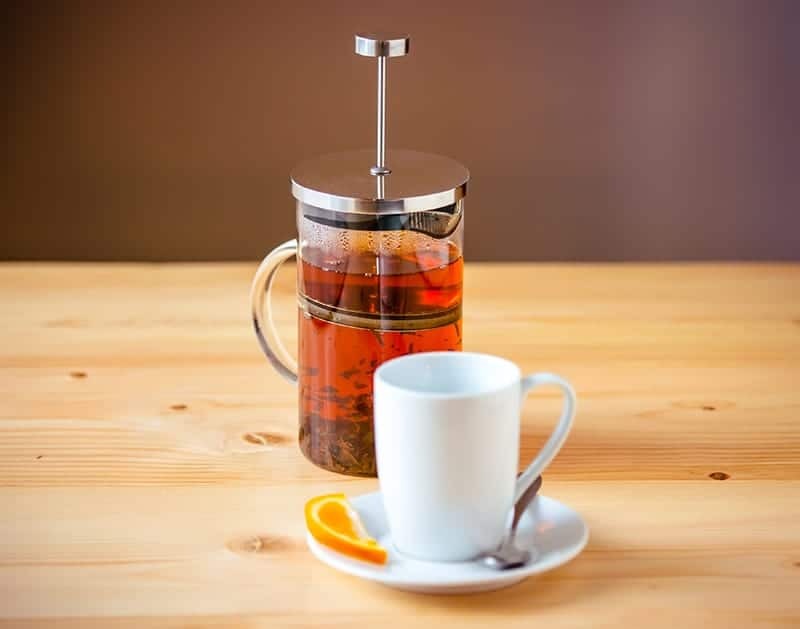 A filter stops the grounds from “infiltrating” in the beverage, but more often than not, the nutritious essential oils in coffee are filtered, too. These oils are packed with antioxidants. It’s needless to say that those are also filtered. Second of all, the brewing temperature is always steady, which helps the grounds release their delicious flavor. 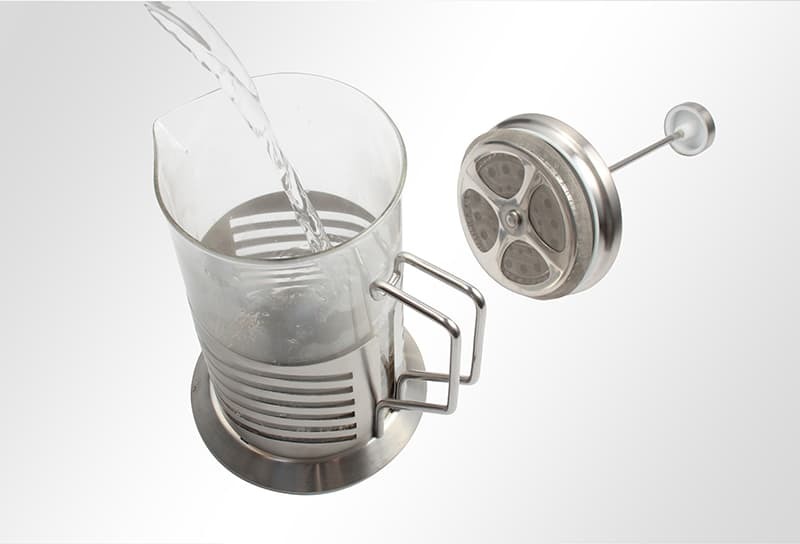 A drip machine, for instance, heats up the water at the beginning of the brewing process, then it stops. Not much brewing there, for sure. The temperature is one of the reasons why French press brewed coffee tastes so good. It’s low-maintenance. You won’t need to make costly repairs or browse the Internet high and low for parts. You use it and clean it; it’s that simple. Of course, that also makes it cheaper than other so-called “high-performance” coffee machines. As long as it works and you get your coffee, the last thing you need is to spend hundreds of dollars on espresso makers that are no better and no worse. Another advantage of using a French press is the rich content of released caffeine. Because the coffee grounds are steeped in hot water, they will release more caffeine. Although excessive caffeine has been linked to cardio-vascular diseases, it is not altogether bad. In fact, it’s actually beneficial for your heart if it’s consumed moderately. Moreover, some recent research has shown that caffeine could potentially prevent Parkinson's disease, as well as Alzheimer’s. This research is, however, inconclusive, and it will take a long time until there will be any definitive result. First of all, don’t take out the remaining grounds with your hand. Second, don’t pour them in the sink. Did you know that wasted grinds can be used as fertilizer for your flowers? That’s right, simply dump them on the soil in your pots and you save a couple of bucks. As for the cleaning itself, here’s how you do it properly: fill half of the beaker with warm water and add just a few drops of soap. Don’t wash it with your hand; it’s simply ineffective. Use the plunger. Press it and release it for a couple of times. The press will be cleaned evenly. Do it in two sessions, to make sure that there’s no residual oil or grounds left in the beaker. Buying high-quality coffee would be the first thing to do. There are some brands that are known for being bitter, so stay away from them. Moreover, buy whole beans, not already ground coffee. If a pack is not sealed properly, the coffee tends to spoil. Subsequently, it will become bitter. The best way to make sure that you get fresh coffee is to grind it yourself. Do not over-extract your coffee. This is why it’s so important to pour your coffee into cups as fast as the brewing process came to a halt. The longer the coffee stays on the grounds, the bitter it will become. Don’t use scalding hot water. When you do that, the grounds are burned and they’ll definitely be bitter. To make sure that the temperature of the water is optimal, boil it and then let it sit for a minute or so, to cool down. After that, it’s ready for use. Clean the French Press after each and every use. The caffeine oil and the old grounds contribute to future bitterness. Some believe that caffeine oil helps in making the taste of the next coffee even richer, but that’s not really true. Repeat the steps we’ve mentioned in the section dedicated to cleaning. Get a good grinder. 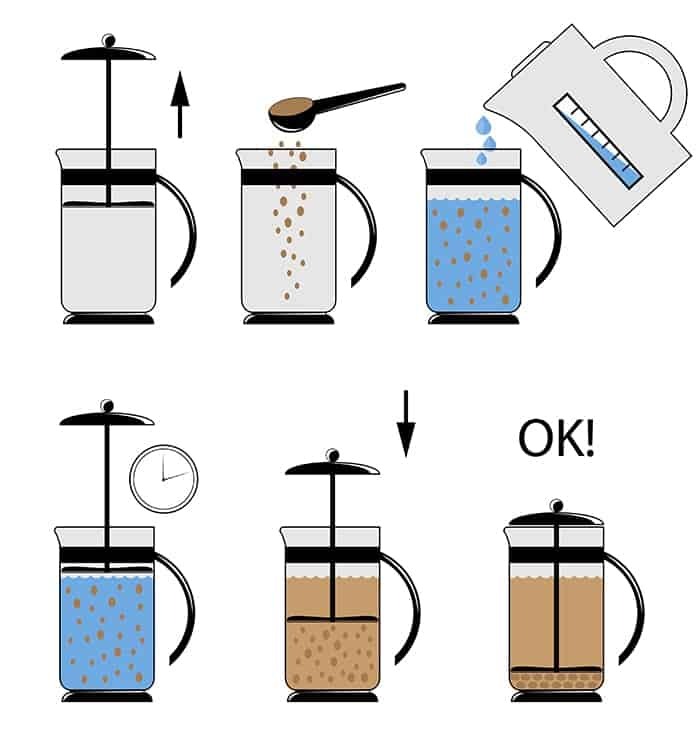 Chunks of coffee (burrs) are brewed slower than fine grounds. Those burrs are extremely bitter, and they’ll spoil the coffee. And that’s not even the problem. If they end up in your mouth and you chew on them, they’ll taste so bad that you’ll want to throw away your coffee. Did you know that in the United States alone, 400 million cups of coffee are drunk daily? That’s a huge number. But what about worldwide? Eh, just a whopping 2.25 billion cups are consumed each day. Humans surely love their coffee. 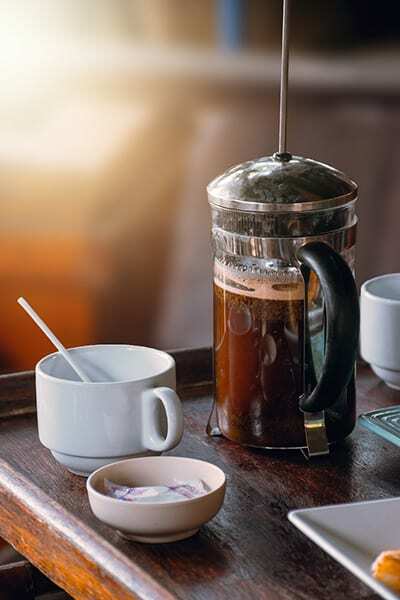 Coffee can be brewed in various ways, but a French press is obviously one of the best choices. It’s a great way of making sure that you’re taking advantage of the coffee flavor in full. So, maybe you should consider throwing out the drip machine. A French press is extremely cheap, so everyone can afford one. If you’re a rookie in brewing coffee, then this guide will surely come in pretty handy. Once you’ve made your first pot, you won’t need to spend money in coffee shops ever again. It’s as much about the experience of brewing it as it is about drinking it. Grab your French press and use the quantities we mentioned for now. After brewing for a couple of times, you can make your own recipe. 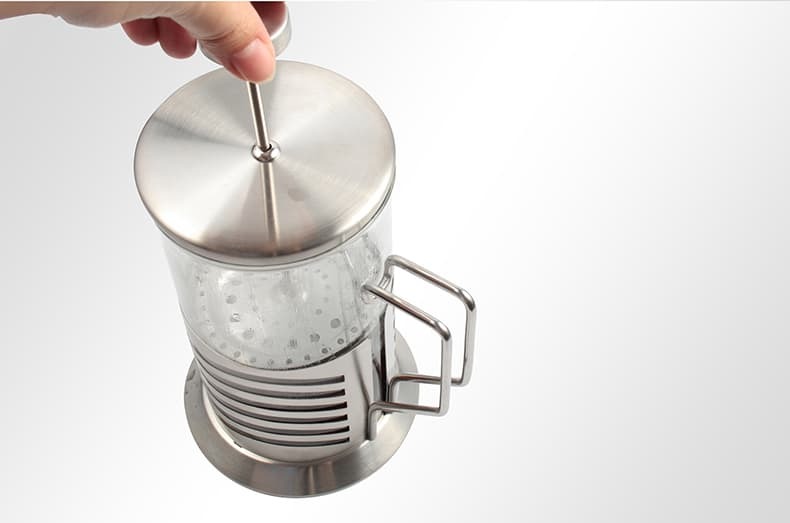 Are you inspired enough to exchange your drip machine for a French press? Which of the two do you think is better? Give us some arguments for your choice.